I include these rough notes on FISHER because the FISHERs in Elham, Lyminge and Folkestone have many Roberts, Sarahs, Marys, a Pierce and a Pearce. Prior to 1837, records are scarce and I had to be certain that the link from my GGrandfather Robert FISHER b 1823/5 to Robert b 1729 was correct. This was my long lasting brick wall. Fortunately, the searching diligence and clarity of thought of my first wife Valerie was offered. For her guidance I thank her sincerely. I list the sequence of records which, together with a few clues from Chris Graham-Rowe's work on RootsWeb, complete the link. There are some minor errors to correct and publish to save this exercise having to be repeated. When was Robert FISHER born and which Robert is my GGrandfather? 1. 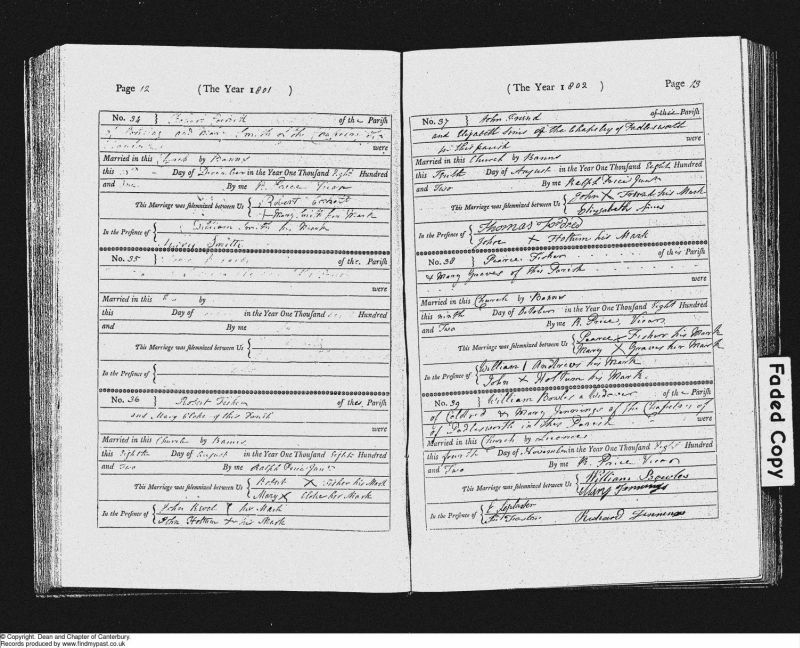 The names of children listed in 1871 & 1881 Census are those known in family records. 2. GGrandmother Sarah who died at Winterage farm 13 Aug 1881 aged 52; was buried at Newington Church yard. 3. GGrandfather Robert retired after her death and lived with various family members, (1891 Census), until he died 4 March 1911 aged 88. He is buried at Hythe Church Yard. In the 1871 Census GGrandfather Robert has given his age as 46, a possible error of one year which together with not yet celebrating his birthday that year, might suggest the year "1825", and this year has been coupled with his birth in RootsWeb publications, in error. He also forgot his age at his wedding to Sarah as the certificate shows. Pierce FISHER is recorded, age 40 (b1801) in 1841 Census with wife Mary and family including Robert age 16 (b 1825). This is the record that tends to affirm Robert's DOB erroneously as 1825. With so many references to 1825 in the records, it throws doubt on the accuracy of Aunty Bell's (Isabella FISHER) family records. However, the IGI records are all deduced DOBs. Robert died in 1911 when Bell (b 1899) was 12 and her notes were made in her 70s sourced from other family members. One could argue poor memory and age throw doubt on her accuracy. The weight of evidence from Census records suggests I should withdraw my lifelong respect for the infallibility of Aunty Bell. I do not. Although not knowing his birth day she is confident of the year 1823 throughout.. However none of this throws doubt on the correct identification of Robert FISHER with so much other supporting evidence. 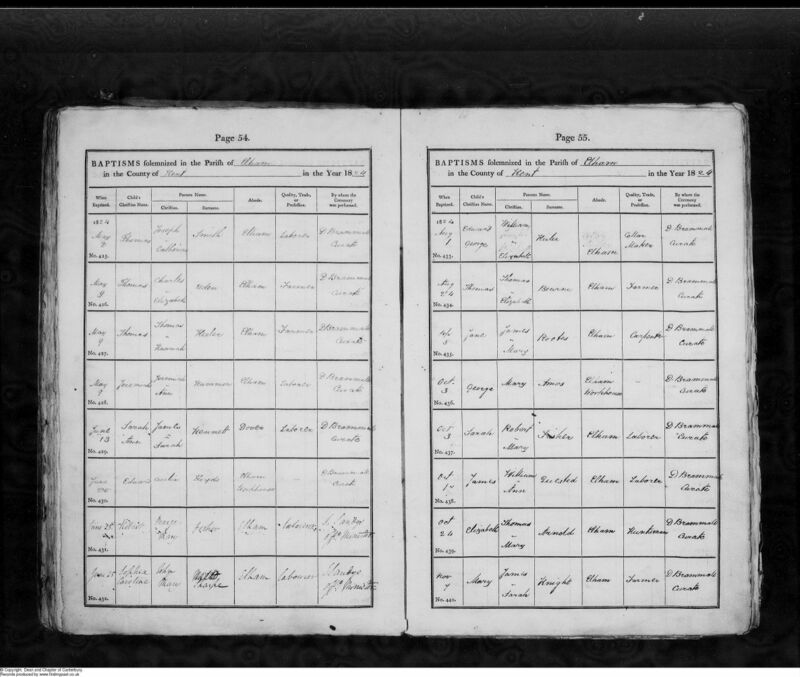 In Elham baptism records, his baptism is given clearly as 25 Jun 1824 and father spelt Pearce, so I conclude, he was born in 1823, baptised in 1824 and used 1824 as his birth year, often understating his age at Census time leading to 1825 often being recorded. Pearce and Mary were married on the 17 April 1824 and Robert baptised on 25 June 1824 and so understatement may have been encouraged. 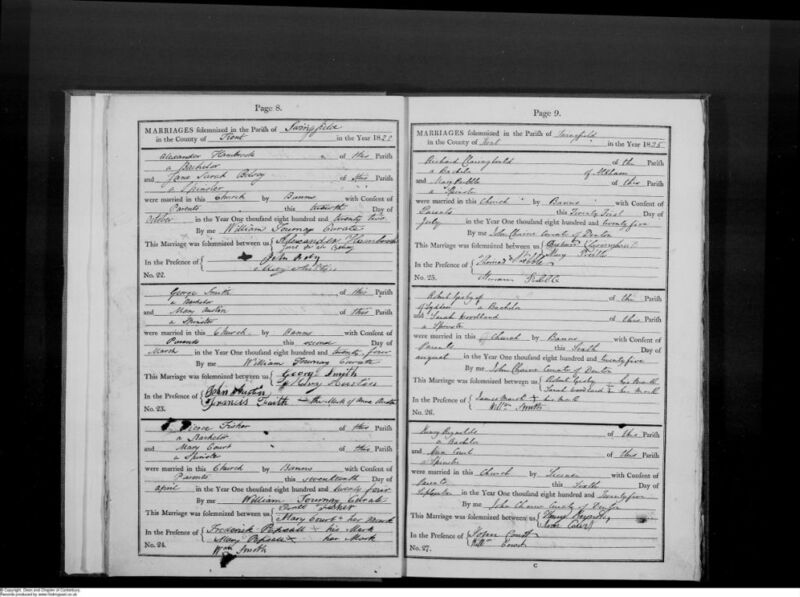 (1) The baptism and marriage records of Robert Fisher both show Pearce Fisher b 1799 as Father. 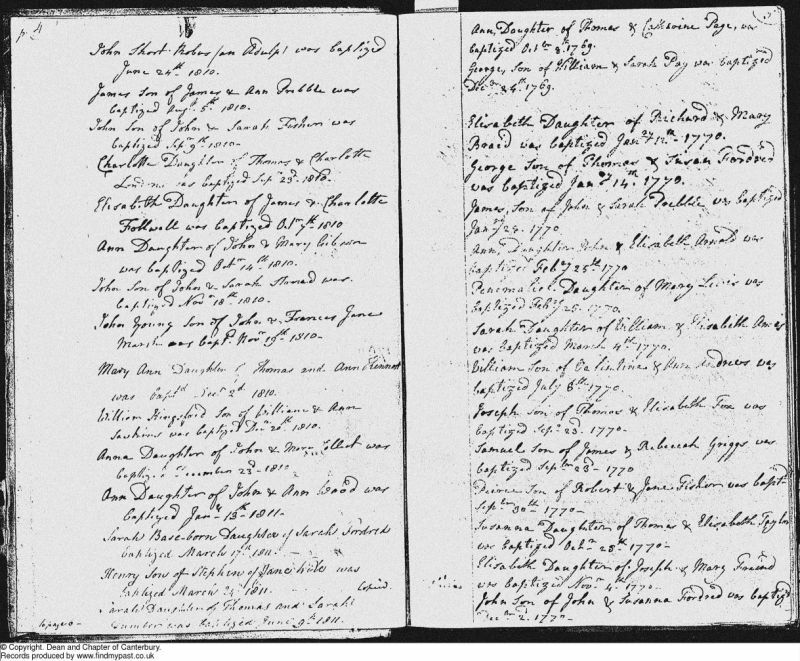 (2) The spelling "Pearce" is used in Elham church baptism records of his children: Robert, and Mary, but "Pierce" for the later, Harriet, Eliza and Frederick. 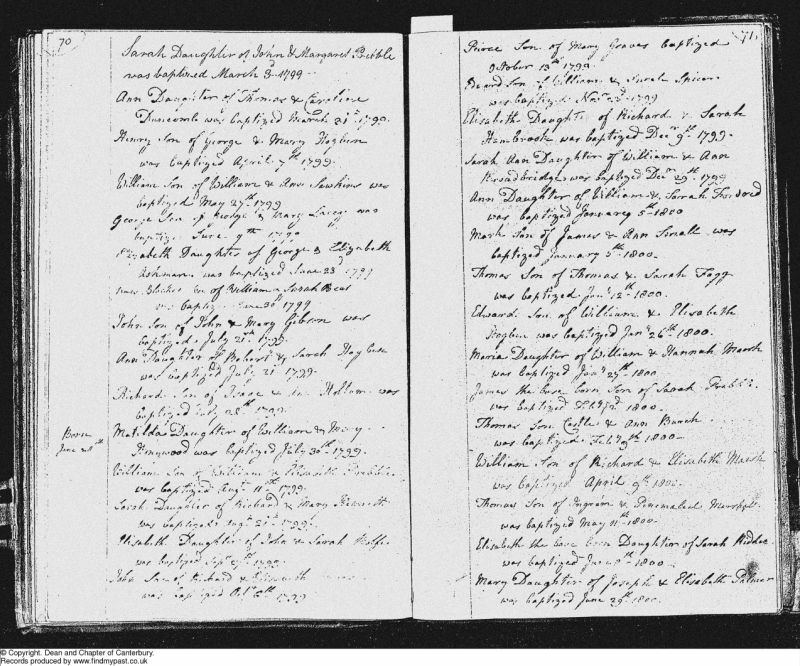 (3) I find no baptism record for Peirce Fisher b 1799, although Graham-Rowe quotes 13 Oct 1799. There is a reference on IGI to a Peirce FISHER baptised at Lyminge on this date in which the surname may have been recorded erroneously. Crucially there is a baptism record of a Peirce GRAVES at Lyminge for this date s/o Mary GRAVES. Pearce died in Elham 1878 having been finally recorded on the 1871 Census in Folkestone. 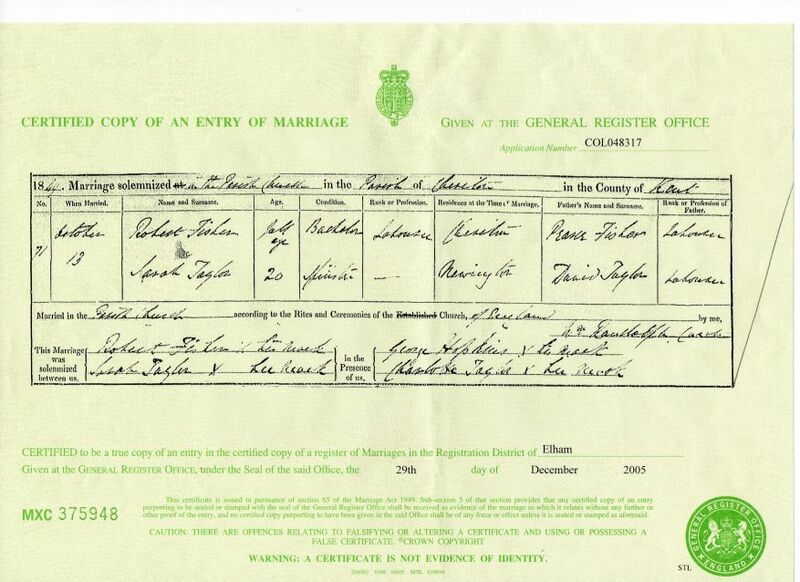 (4) The marriage record of Pierce Fisher b1799 to Mary Court shows no parent names. There is no evidence of a link to father, Pearce b 1770 as IGI suggests. This link is assumed on the basis of family group location and the baptism reference (4). (5) The baptism record of Peirce b 1770 clearly gives Robert and Jane as parents. His marriage record uses both spellings. Pearce FISHER died 1845 ...... death cert shows Peirce age 75 and informist Sarah "Bushel" at Barham..
(6) There is a link to the father of Peirce b 1770 in his baptism record and one concludes this is Robert b 1730 nearby at Monks Horton, who married Jane PEARCE which indicates the origin of the christian name "Pearce".and the confusion with "Peircey ", his GMothers first name. (7) Robert's father William b 1695 of Brabourne, is the only local William Fisher of marriage age in 1723.who coincidentally married a "Peircy". Thus the name "PEARCE/PEIRCE/PIERCE flows back through the generations.A tenuous link but a plausable one on which to base genealogical deductions. (8) The image of the 1723 marriage record in Canterbury shows "ffagg" i.e."FAGG". 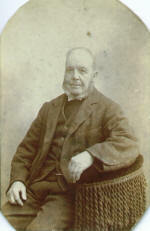 "Peircy" of parish Stanford. (9) Monks Horton and Brabourne are adjacent hamlets 4 miles west of Lyminge. (10) This baptism record is the only record of a Thomas in this area (Brabourne) of an age to be the father of William. By accepting the baptism record for Peirce GRAVES 13 Oct 1799 at Lyminge as that for the baptism of Peirce2 FISHER, to mother Mary GRAVES, and accepting the uniqueness of the recorded names in the close location of Brabourne, Monks Horton and Lyminge, it is safe to assume that Thomas FISHER bap 1674 is the ancestor of Robert Fisher bap 1824 and thus my GGGGGGGrandfather. I am sure Peirce1 would have done the honourable thing: and the clue is in the name. 1851 Census age 26 at Newington Hill with Sarah and 1 dayghter Sarah. 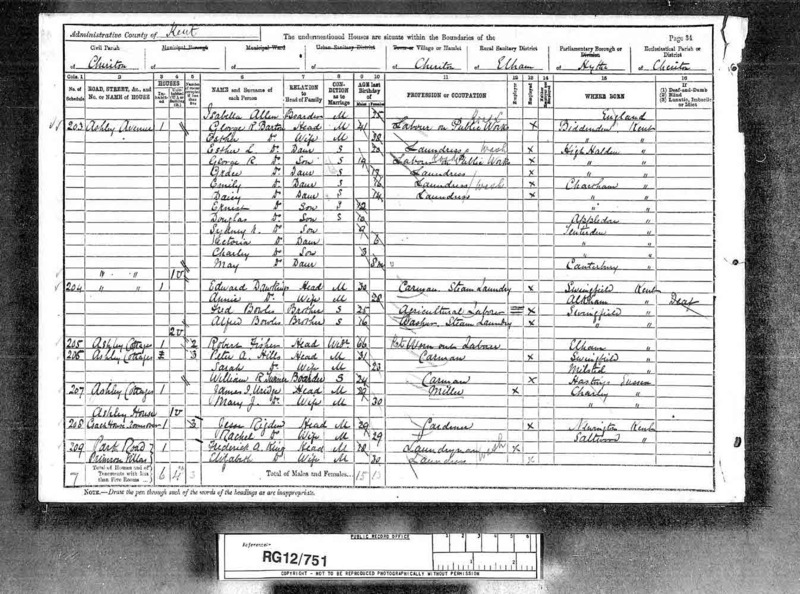 1881 Census age 57 at Winterage Farm with Sarah and 4 children. Sarah died 13 Aug 1881 at Winterage Farm. Daughter Harriet married William May and stayed on as tenant at Winterage after he died. 1891 Census age 66 at Cheriton, widower, retired and alone. Is this he? 1841 Census age 40 at Elham with Mary COURT age 35 and 6 children (James age 2) and William COURT, Mary's father. 1851 Census age 55 at Elham with Mary age 47 and son James aged 11. 1861 Census age 60 at Newington with Mary age 57 and son James aged 21 and Thomas CLAYSON boarding. 1871 Census age 73 at Mill Lane, Folkestone with Mary age 69 and daughter Ann and 2 CLAYSON children. Pierce died in 1878 in Folkestone. In the 1861 Census Ann Clayson is housekeeping for her sister Mary's MOUNT family in Cheriton after her death in March 1861. Ann Clayson marries James McGuire c 1876. The 1881 Census shows the new family and widowed Mary COURT. Most parish records use the spelling "Peirce" and this is also one of the two spellings associated with "Peircy FAGG", the other being "Piercey". The spelling "Pierce" occurs frequently in Census records.